Reading and share top 16 famous quotes and sayings about Neverland by famous authors and people. 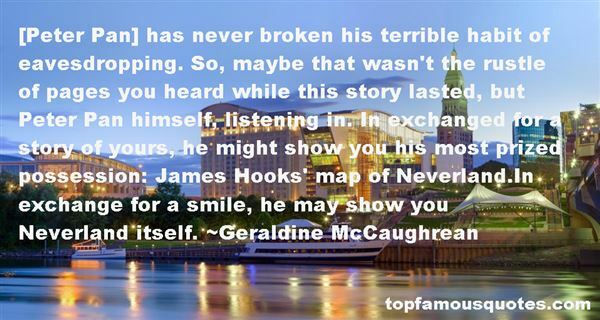 Browse top 16 famous quotes and sayings about Neverland by most favorite authors. 1. "If Peter Pan had been real, he would've gone mad and killed everyone in Neverland." 2. "After seeing amazing magical places like Neverland, Oz, Narnia and Wonderland, why did you ever want to leave?" The girls looked to one another; they had never been asked the question before, at least in Alex's mind. "Because no matter where you go or what you see, you'll always want to be where you belong," Lucy said. "Your home is where you feel most comfortable and loved," Wendy said. "It's a part of you," Alice added. "It's where your family is." "There's no place like home," Dorothy said, as if it was the first time she'd ever said those words. Alex appreciated what they had to say, but wasn't sure if she entirely agreed. "I wonder, though, if home sometimes isn't where you're from," she said. The girls looked at her as if she had already answered her own question. Alex wondered if that had been the real question lingering in her mind all along." 3. "We live in an adolescent society, Neverland, where never growing up seems more the norm than the exception. Little boys wearing expensive suits and adult bodies should not be allowed to run big corporations. They shouldn't be allowed to run governments, armies, religions, small businesses and charities either and just quietly, they make pretty shabby husbands and fathers too. Mankind has become Pankind and whilst "lost boys" abound, there is also an alarming increase in the number of "lost girls." 4. "When two or three people come together in the name of Neverland then I will be there amidst them or if I am too busy or have a better offer, then I will send a proxy or you can just have the tantrum without me, whatever." (King James Version: Gospel of St. Peter (of Pan)Verse: Blah Paragraph: Blah, blah"
5. "How did you ever get here, Maddie Brodatt? ""'Second to the right, and then straight on till morning,'" she answered promptly-it did feel like Neverland. 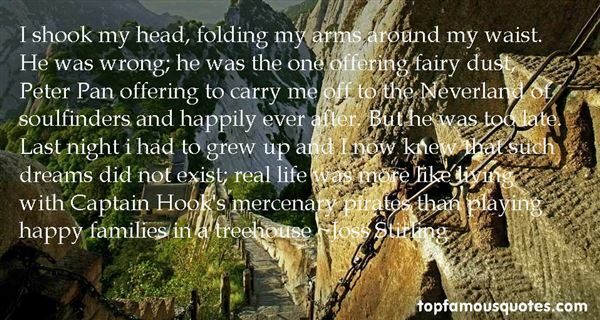 "Crikey, am I so obviously Peter Pan? "Maddie laughed. "The Lost Boys give it away. "Jamie studied his hands. "Mother keeps the windows open in all our bedrooms while we're gone, like Mrs. Darling, just in case we come flying home when she's not expecting us." 6. "Inside my snowsuit, inside my sweatshirt, inside my thermals, under my braid, the short hairs on my neck stood on end. "People change. That's all I meant," said Titus, stroking them down again. "Even me? ""I daresay. I'd hate to bring an untimely death on any fairies, but I don't believe in Neverland." 7. "[Peter Pan] has never broken his terrible habit of eavesdropping. So, maybe that wasn't the rustle of pages you heard while this story lasted, but Peter Pan himself, listening in. In exchanged for a story of yours, he might show you his most prized possession: James Hooks' map of Neverland.In exchange for a smile, he may show you Neverland itself." 8. "Of all the delectable islands the Neverland is the snuggest and most compact, not large and sprawly, you know, with tedious distances between one adventure and another, but nicely crammed. When you play at it by day with the chairs and table-cloth, it is not in the least alarming, but in the two minutes before you go to sleep it becomes very nearly real. That is why there are night-lights." 9. "Of course the Neverlands vary a good deal. John's, for instance, had a lagoon with flamingos flying over it at which John was shooting, while Michael, who was very small, had a flamingo with lagoons flying over it. John lived in a boat turned upside down on the sands, Michael in a wigwam, Wendy in a house of leaves deftly sewn together. John had no friends, Michael had friends at night, Wendy had a pet wolf forsaken by its parents..."
10. "Second to the right, and straight on till morning. "That, Peter had told Wendy, was the way to the Neverland"
11. 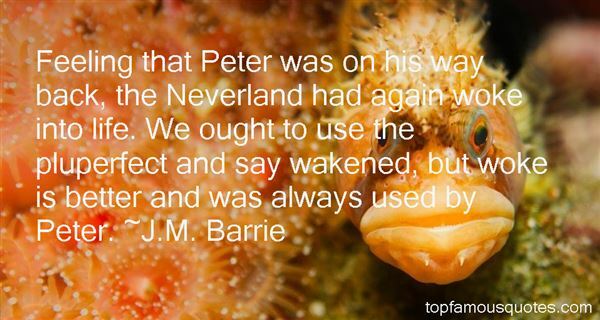 "Feeling that Peter was on his way back, the Neverland had again woke into life. We ought to use the pluperfect and say wakened, but woke is better and was always used by Peter." 12. "If I had my own Neverland it would probably be the coolest place in the world. You could do anything you want there. There would be trees everywhere." 13. "Look," Peter said.To the north was a series of vast grassy plains, and there, just looking like specks at first, was a herd of horses, a species that in Neverland had never been tamed. They were beautiful, flashes of brown and black and tan, their coats gleaming. There was no reason for them to be running that Tiger Lily could see. It was likely that they just loved to run. "That's what I want my life to be," Peter said, staring down at the horses.Tiger Lily sank against him and watched the herd, and thought that was what she wanted too." 14. "I shook my head, folding my arms around my waist. He was wrong; he was the one offering fairy dust, Peter Pan offering to carry me off to the Neverland of soulfinders and happily ever after. But he was too late. Last night i had to grew up and I now knew that such dreams did not exist; real life was more like living with Captain Hook's mercenary pirates than playing happy families in a treehouse"
15. "Then again," he continues, turning to me as we approach the busted old birdbath- the point where Neverland ends and the rest of the world begins- "never say never." 16. "So come with me, where dreams are born and time is never planned. Just think of happy things, and your heart will fly in wings, forever, in Never Neverland!!" Adversity isn't an obstacle that we need to get around in order to resume living our life. It's part of our life."